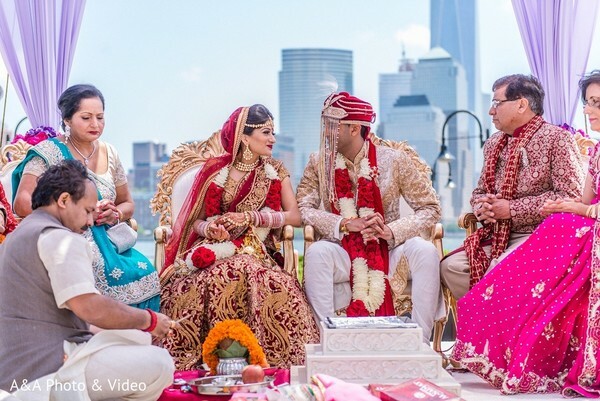 If you're just joining us today, we're treating ourselves to an exclusive look at Rena and Neil's Indian wedding at the Hyatt Regency Jersey City on the Hudson, which has been artfully captured by the fabulous team from A&A Photo & Video, who also created the pretty pair's Filmy feature! 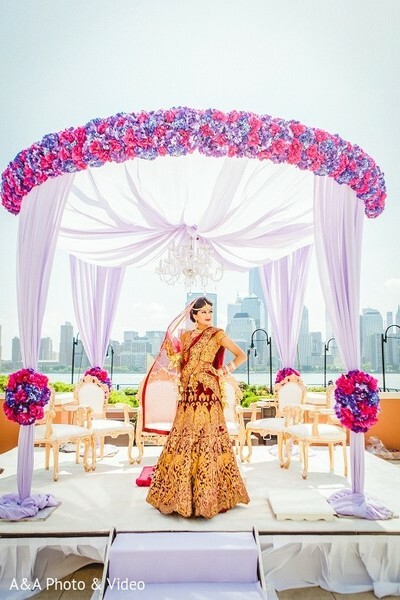 Industry experts, Ring to Aisle Events, have planned and designed the most breathtaking outdoor ceremony for the husband and wife-to-be, which features a waterfront mandap with violet and lavender floral and decor by Elegant Affairs that will make you swoon! 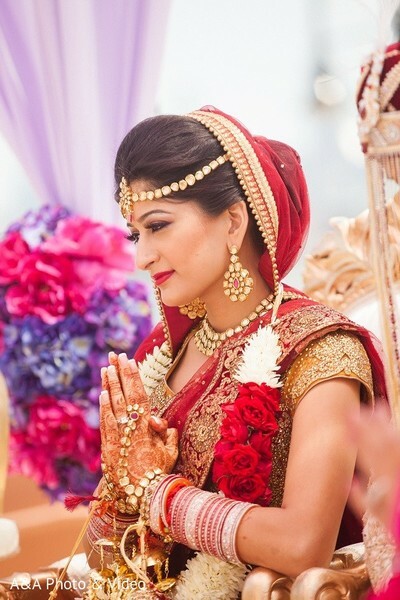 Donning a traditional red wedding lengha by Rohit Verma, and rocking some seriously styled hair and makeup by Kanwal Batool, today's Indian bride is the picture of perfection in every conceivable way. 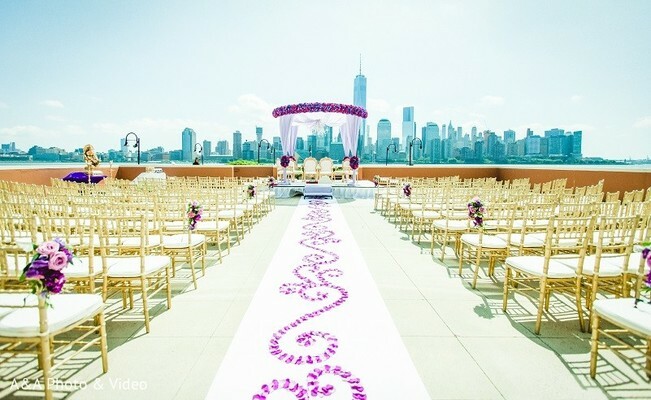 Her aisle has been decorated in a beautiful design composed of purple petals, and the sea of Chiavari chairs filled with loved ones have been elegantly capped with bunches of plum perfect bouquets! 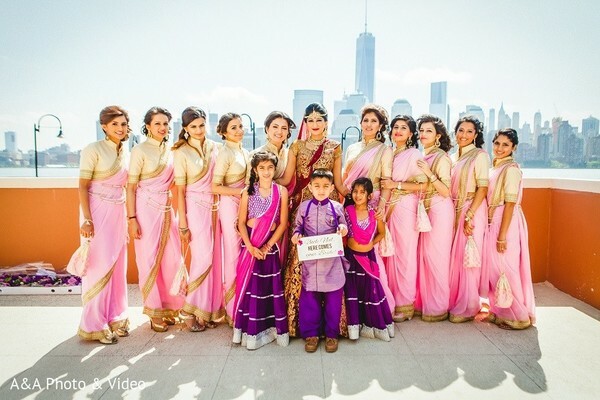 Head into the complete gallery for even more spellbinding details from this sunny Jersey City wedding ceremony! I'll be right back with a sensational collection of post-celebratory details you won't want to miss! Elegant Affairs Inc., Kanwal Batool, AATMA Performing Arts and Ring to Aisle Events are members of the Platinum Guide. Love what you see? Explore their portfolios.